The cottage is situated on a bluff right above the ocean waves, with A full 180 degree ocean view. The setting is very peaceful with no road noise or ambient lighting. A careful eye will catch exquisite offshore birds and sea life, including migratory whales. Acreage includes hundreds of blueberry, huckleberry, and blackberry bushes. Behind the cottage is a Sitka Spruce Forest with Redwoods a few hundred yards away. Pets are NOT allowed, No Smoking. Trinidad is a historic town boasting a small natural history museum, fishing pier, and boating. Proximity within a short drive are Redwoods (Redwood State Park), Lagoons (Big, Stone, Dry and Fresh Water), Beaches (Trinidad, Agate, Clam, and many more), Coastal Mountains and State Parks. It is a short drive to Arcata and Eureka for a variety of restaurants, museums, galleries, and shopping. The cottage features a full kitchen, all cooking utensils provided. (A charcoal grill is also available upon request!) Two bedrooms and one full bath, comfortably sleeps 4-6 (Unfortunately no pets allowed.) Guests will enjoy fresh comfortable linens, WiFi internet access, wood burning stove and furnace, and the cottage is also equipped with a full washer and dryer! 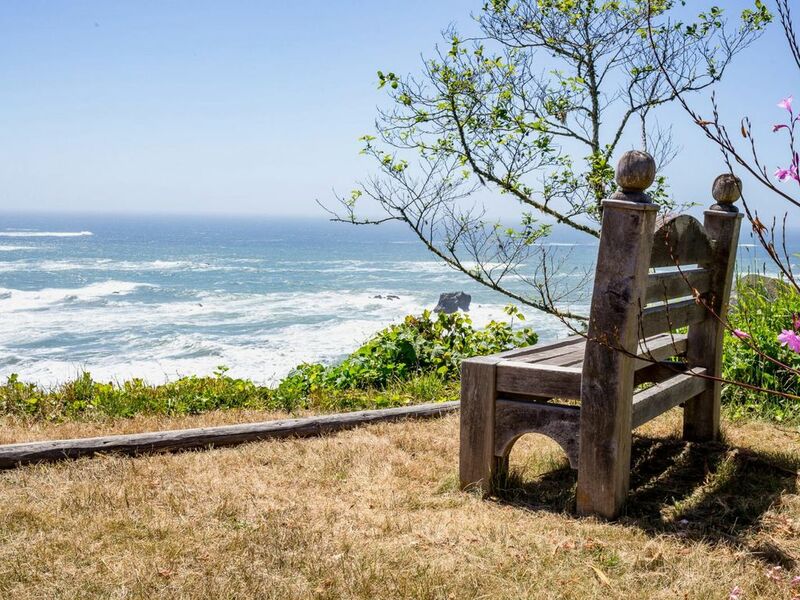 Visitors will enjoy the view from Trindad Bluffs overlooking the fishing boats, surf, and rugged coastline of California's North Coast. Situated on the rugged Pacific coast of California's North Coast, the cabin is in the quaint town of Trinidad nestled among the redwoods, atop the cliffs overlooking the Pacific's pounding surf. Fully equipped kitchen, stove, refrigerator, microwave, coffeemaker, cookware and dishes provided. Our family really enjoyed the stay. We especially enjoyed the simplicity of everything and the beautiful surrounding space. The forest and and windy roads and the tall bluff and the waves crashing below. The amazing sunsets! The flowers and plants on property and the wildlife (deer) that we were able to observe. Accommodations were basic and simple but more than enough. Kitchen had everything I needed to cook all week. Even a French press in the cabinet and a tea pot on the stove.